Note: in theory this stuff all works on Linux and OSX but you’re on your own, let me know if you get it working! Maybe print this out before you start. Obtain a Nintendo DS and a cartridge that will let you run homebrew (I use an R4DS – http://www.r4ds.com – works great). If you get stuck here, hit up Google. You need a wireless router or something else that will let you connect your DS to the network your computer is on. Make sure that you can connect to the Nintendo WFC online services. If you get stuck here, hit up Google. 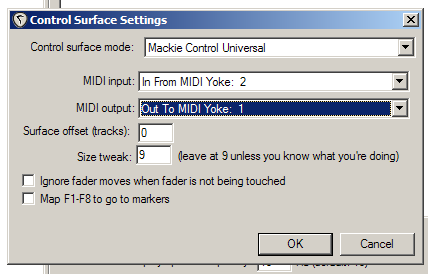 Go to http://www.midiox.com/myoke.htm#Download and download MIDI Yoke NT 1.75 (163K 09-23-07) (NOT the manual install). Run it. You might need to reboot. Go to http://dsmi.tobw.net/index.php?cat_id=1 and download the DSMIDIWiFi Server for Windows. Extract and run it. 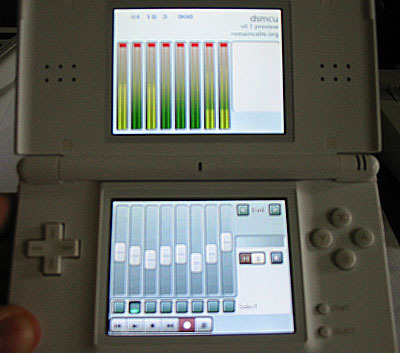 Download the dsmcu.nds file and get it onto your DS flash card (i.e. R4DS, whatever). You don’t need to patch this file or do anything weird with it, just put it on there. Boot your DS and run the dsmcu.nds file. If it locks up with a faint “MIDI: ?” message on the bottom screen, that means it can’t connect to your network. If you can play DS Tetris on the internet and this still doesn’t work, contact me. 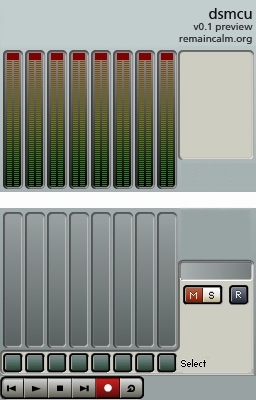 If dsmcu can connect to the internet, the screen will fill with faders. This is good. Download and run Reaper. Go to options/preferences and select the Control Surfaces section (near the bottom). Click Add to add a new control surface. Leave everything else at default settings. When you click OK, everything should work. If it’s doesn’t work, try setting the DSMI output to Microsoft GS Wavetable Synth and seeing if noise is made when you click on the transport buttons on dsmcu.